Living without a dresser or closet might be a shock to some – but there are closet alternatives out there! If you are looking for clothing storage ideas for small bedrooms, you are not alone. We don’t have a closet or dresser in our current apartment. We also didn’t want to buy a big closet since we know we’re not going to live here forever. So, we needed clothes storage ideas for our small space. 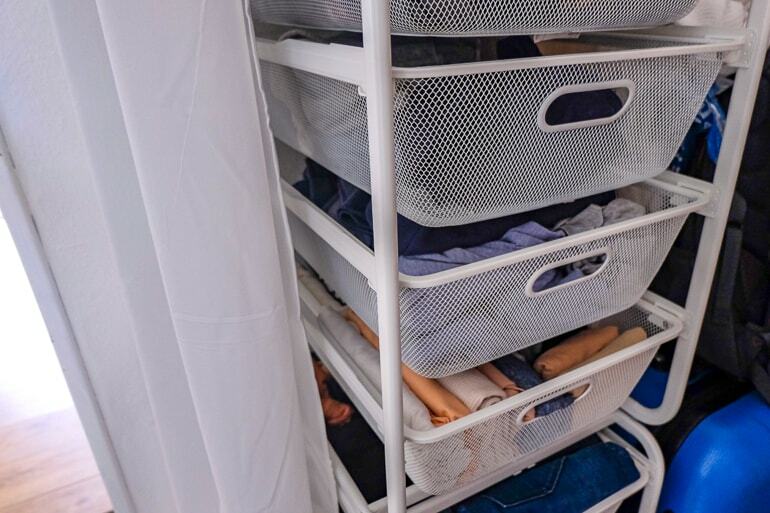 Aside from building a closet – which was a no-go being on a budget – we have tried to come up with solutions that make storing clothes easy even when you don’t have a lot of space. That said, we turned to IKEA but ALSO made a few lifestyle shifts so that we had less clothing in our small space to begin with! Below is how we store our clothes and tips you can use, too! 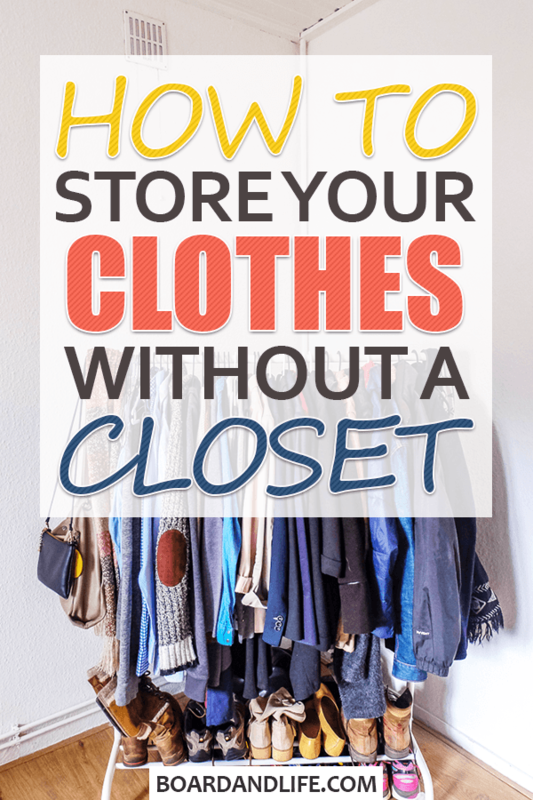 Storing all your clothes without a closet can be difficult when you have a big wardrobe. That’s why we recommend purging your clothes either before you move or before you are trying to set up your new clothing storage system. This way, it will be a lot less frustrating (and overwhelming) trying to fit everything into your home – especially if you live in a small apartment like we do. Before we moved, Lisa donated around 6 bags of clothes that she hasn’t really worn in a long time. 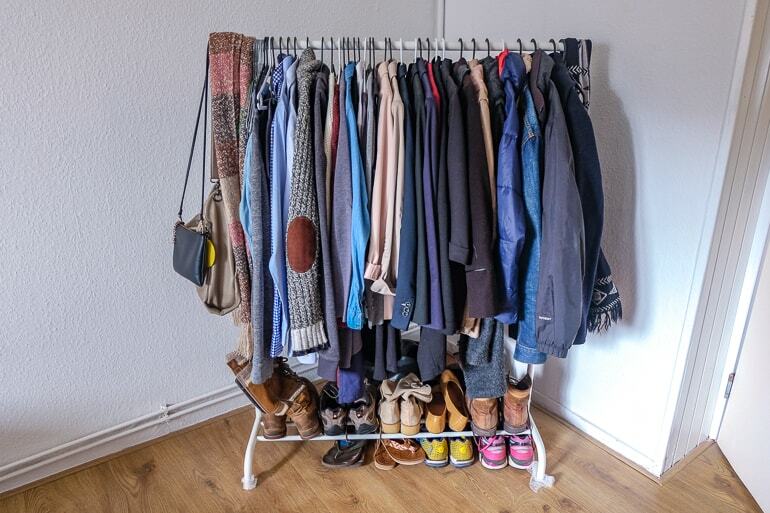 As we have mentioned in our decluttering and organizing blog post, Marie Kondo’s concept of only having things that spark joy has really helped us reduce the number of new clothing items we buy. In fact, we haven’t bought new clothes for a whole year. However, we still had quite a few items from the years before our mindset and consumption shift – and it felt SO good to get rid of them. That’s why we strongly recommend that you go through all your clothes, shoes, handbags etc. before trying to make your storage solution work. By owning less, it will be quite a bit easier to find a way to store your clothes that works for you. This is our entire clothing rack – all shoes and hanging items. Instead of a closet, we actually use a clothing rack similar to this one. On it, we hang items such as outdoor jackets, dresses, blazers, dress shirts, nicer pants – basically anything that we don’t want to fold and get wrinkled. The nice thing about our clothing rack is that it has space at the bottom where we store some of our shoes that we wear during the season. If you needed more storage space for things like socks, underwear, or workout clothes, you could also purchase some boxes and use those. One tip we have is buying hangers that are quite slim. This way you can fit more clothing items onto your clothing rack. We also like to use hangers such as these ones since they make it easy to store more than one piece on a hanger. For example, we would put a cardigan or blazer and a pair of dress pants on the same hanger. You can also “double stack” tops. For example, we like to put short-sleeved shirts and cardigans or jackets on the same hanger to save space. You could do this with clothing pieces that you wear together frequently anyway. This makes it super easy to grab an outfit in the morning. The only thing we try to avoid is putting long sleeved shirts and jackets on the same hanger. This can sometimes wrinkle the sleeves or make it a hassle to take off the jacket when you want to grab the shirt. Here are our shelves – yup, IKEA. As mentioned before, we also don’t have a dresser since these can often be big and heavy. We also know that we are not going to stay in our current apartment forever. That’s why we wanted something that can easily be taken apart again. We ended up with two sets of the IKEA Algot Frame + Basket set. After six months of using it, we can honestly say that we really like this system. We have 8 mesh baskets which are quite deep and thus allow us to store a lot of clothes in one drawer. It was intended that each of us to get 4 baskets, but it ended up being 5 baskets for Lisa and 3 for Bruce. In order to maximize the space that we have, we have stacked our Algot frames on top of each other. This was super easy to do since the system comes with clips that are meant for that. There are also similar storage solutions by other companies that come with more or less drawers – so just have a look around and find something that works for you. Instead of getting mesh drawers you COULD also store your clothes on a shelf. However, we feel like it would get too messy over time. You’d also have to fold your clothes very neatly frequently so it doesn’t look cluttered. That’s the main reason why we decided to store our clothes in drawers instead of a shelf. When you only have limited storage space to begin with, it does not make sense to have all your clothing items out all year round. What we like to do is go through our wardrobe four times a year (at the beginning of a new season). 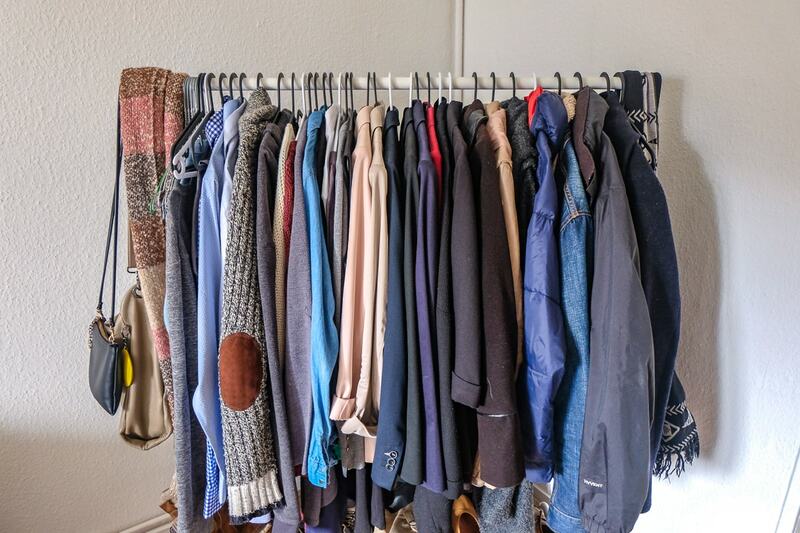 During that process, we might get rid of some clothing items that we haven’t worn in a long time, but it is mainly to put away the clothes that we know we won’t need over the next few months. For example, at the beginning of spring we like to go through our wardrobe and take out thick winter coats, big sweaters, long underwear, winter running equipment, etc. We’ll then put these items into storage containers that we don’t need to access frequently. For now, we store these items in an old moving box. However, we eventually want to get storage bags for underneath our bed such as these ones. At the same time we’ll also go through our storage boxes and get out more spring clothes, such as T-Shirts, dresses and skirts that we know we’ll wear more often during that season. If these clothing items have been in the storage containers for a while, we’ll usually wash them before putting them in the drawers/hanging them to make sure they have a nice, fresh smell. And there you have it – our tips for how to store your clothes without a closet or a dresser! Honestly, when we moved into our new place we were a little confused by the whole “no closet” thing. Now, we have realized there are SO many potential storage options that it doesn’t even matter. Getting rid of stuff also helped immensely. Let us know what ends up working for you!